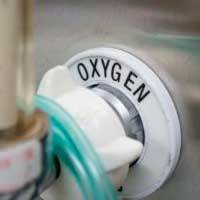 Neonatal asphyxia, or deprivation of oxygen, refers to lack of oxygen during labor or delivery. Although a fetus may be deprived of oxygen at any point during a pregnancy, childbirth is a period during which oxygen deprivation may occur due to unforeseen difficulties during labor and delivery. This condition is known as perinatal asphyxia, and because oxygen deprivation of only a few minutes can result in life-long disability, it is important for the obstetrician to recognize a mother at risk for complications during delivery at the time of the prenatal visit. At this time, if the risks are significant, including breech position at a late state of gestation or placenta previa, a Caesarean section can be planned. Because oxygen is supplied through the hemoglobin molecule in the blood, and because the fetus receives oxygenated blood from the mother, through the placenta and umbilical cord, a drop in the maternal blood pressure at any time during the pregnancy is a potential cause of fetal asphyxia. The mother’s blood pressure may drop as a result of severe infection, dehydration, or traumatic injury with subsequent loss of blood volume. However, these gestational problems are not usually a result of preventable circumstances, and if the mother seeks treatment, the fetal asphyxia can be corrected as the mother’s condition is treated. This may still result in developmental disability, whether physical or intellectual. These cases are unfortunate, but can potentially occur in any mother during the gestational period. During labor and delivery, fetal asphyxia can occur in a variety of situations. Contractions of the uterus cause subsequent interruptions in blood flow to the placenta. This is not abnormal. Any occlusion, or blockage, of the umbilical cord will interrupt circulation to the fetus, causing a decrease in fetal oxygen content, and, potentially, an increase in the content of carbon dioxide or carbonic acid, which are waste products of fetal metabolism. As a result, oxygen supply to the fetal tissues is decreased and an excess of acid, which is normally kept in a steady state known as homeostasis, can occur. Although there are some adaptive mechanisms for the fetus to accommodate to momentary interruptions in oxygenation, the fact remains that these mechanisms are not designed to adapt to any prolonged period of oxygen deprivation. Some situations which must be handled emergently to prevent compromise of the fetal oxygen supply during labor and delivery include fetal distress during prolonged and ineffective labor, or as a result of premature rupture of the amniotic membrane, which may lead to a severe infection of the amniotic fluid. Fetal monitoring during these times demonstrates patterns of abnormal fetal cardiac activity as a result of inadequate oxygenation, and must be addressed by the obstetrician with Caesarean delivery, if vaginal delivery is unlikely to result in a good outcome. Although there are drugs that can induce vaginal delivery, they take time to work, and fetal distress is a definite indication for immediate delivery. Other potential causes of hypoxia during birth include umbilical cord prolapse, which refers to the umbilical cord presenting before the neonate, resulting in compression. The term “nuchal cord” refers to the umbilical cord wrapping itself around the neck of the infant, and must be immediately and correctly manipulated to ensure the child does not suffer from lack of oxygen. Shoulder dystocia, which occurs as the shoulder fails to deliver after the head, becoming lodged on the mother’s pubic bone, frequently results in compression and occlusion of the umbilical cord. Although this condition occurs without warning during the moments of delivery, the obstetrician must maneuver the infant rapidly and correctly to effect delivery. Problems that occur specifically with the placenta during pregnancy may be life- threatening, and include abruption of the placenta, or separation of the placenta from the uterine wall prior to deliver. Resultant hemorrhage results in loss of adequate blood supply to the fetus. An emergency caesarean delivery may save the life of mother and child, as placental abruption may cause an exsanguinating, life-threatening hemorrhage. However, even with emergent intervention, the mortality rate remains high from placental abruption. Oxygen deprivation can result in cerebral palsy, a disorder that includes abnormalities of movement and posture. The brain is especially sensitive to lack of oxygen, and permanent neurologic damage may be devastating. Consequences range from mild developmental or cognitive delay to severe problems that require institutionalization or lifelong care. Infants who suffer from hypoxia may also be at higher risk for Sudden Infant Death Syndrome. Should your child have a significant birth injury, you may face a lifelong burden of medical bills, and you may have questions still about the cause of a poor outcome. The Rich Firm, PC can assist you.